I recently shared the new furniture arrangement in the family room and today I am going to share my new favorite part of this room. 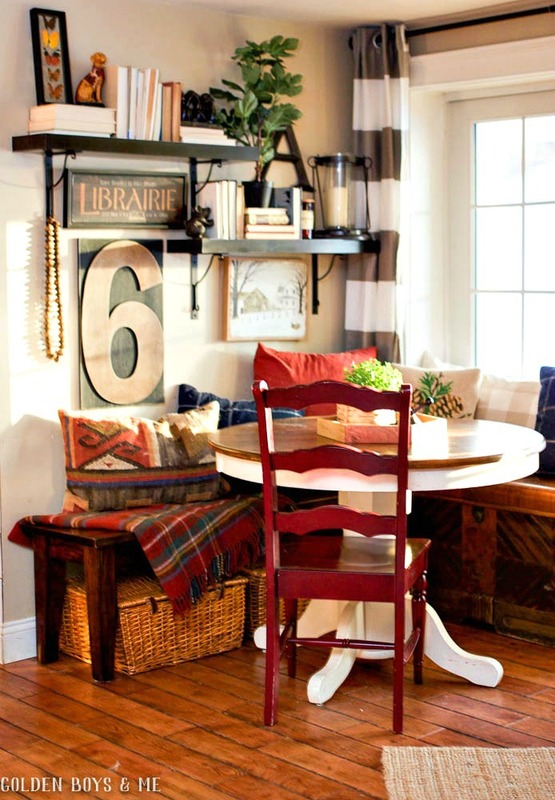 I have always loved "nooks" of all kinds and my Pinterest boards are full of dining nook inspiration. Unfortunately, I haven't found a way to incorporate a dining nook into this house. 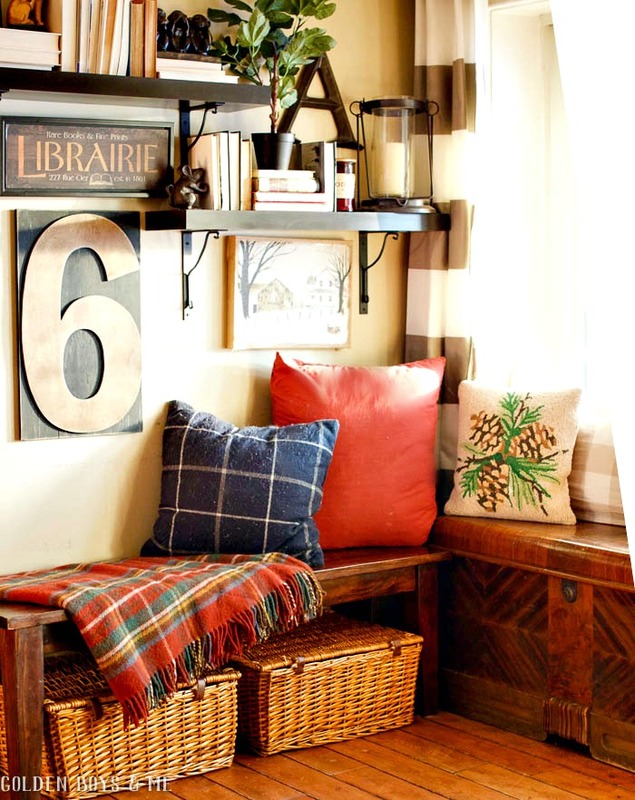 But I started brainstorming how I could add a nook-ish space to our home. Without spending money. I created this new area by placing a bench and cedar chest (both items we already had in the house) into a corner of our family room. The cedar chest is against the triple sliding glass doors and the bench (borrowed from the dining room) is under the shelves. We can still open the sliding glass door if we needed to, but we mostly use the mudroom door so this door is seldom used. Next, I just needed a table. The table has actually been in the family room for a while and is a project from a few years back. We took an old kitchen table that had been an outdated honey oak color. We sanded down the top to give it a distressed finish and painted the legs. We use this as a craft table, homework table, eating table, and desk. Now it is the centerpiece for our family room nook. 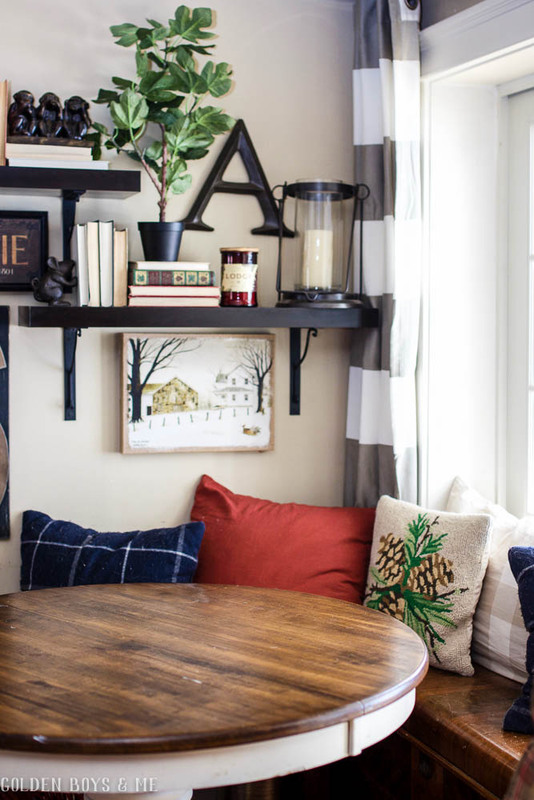 I wanted to share this space because, like many other areas in our house, I have attempted to find a way to add an element that I admire on a website like Pinterest or Houzz and incorporate it into our home in an affordable way. In this case, a totally cost free way because I simply borrowed items from other areas in our house. 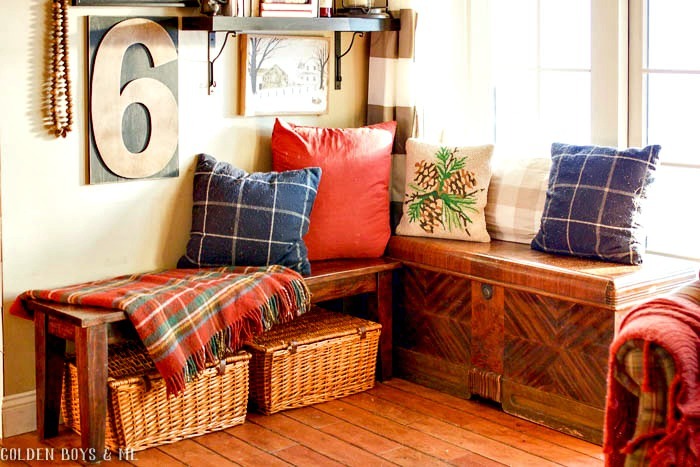 Now we have another cozy spot to hang out at in the family room. Hi, I just love when a new post from you pops up on my screen! Your home has the most Welcoming feel. Love your style and all your little nooks that say Hey come and sit here for awhile...wish that could happen. I'm just getting back into blogging after a too long break. I would love for you to stop over sometime and say Hi! Keep in mind though I'm still working out some kinks. Enjoy your Nook! Love every nook and corner that you show us !!! Such a welcoming home!!! Beautiful Courtney. So cozy. Where did you get the library sign. I want to get that for my daughter. She is obsessed with libraries. In fact if she gets married some day she wants to be married in a library. So this would be cute for her library nook. Have a great day. Thank you! The library sign was from Target a few years back. I know how your daughter feels about libraries because I feel the same way. I swear my blood pressure drops as soon as I enter a library! I never thought of a library wedding. I hope that happens for her someday and I get to see pictures. Genius! I love how you have it all staged, too!!! 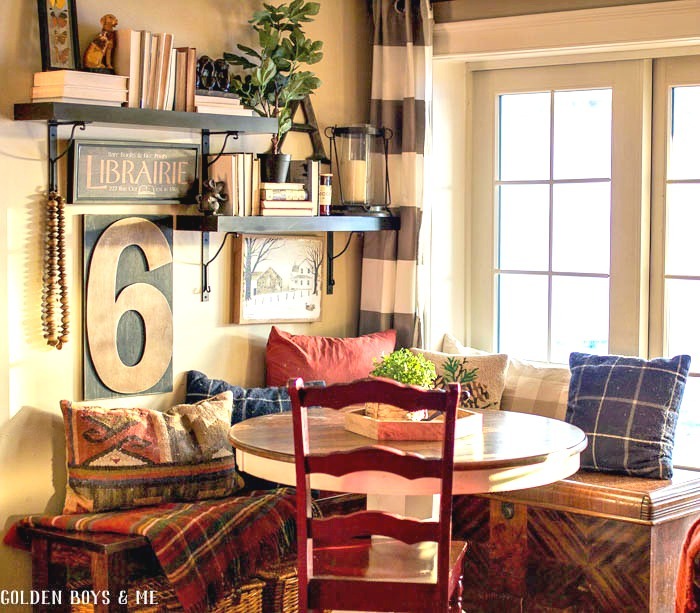 I would love hanging out in your cozy nook...doing projects, or even a puzzle! 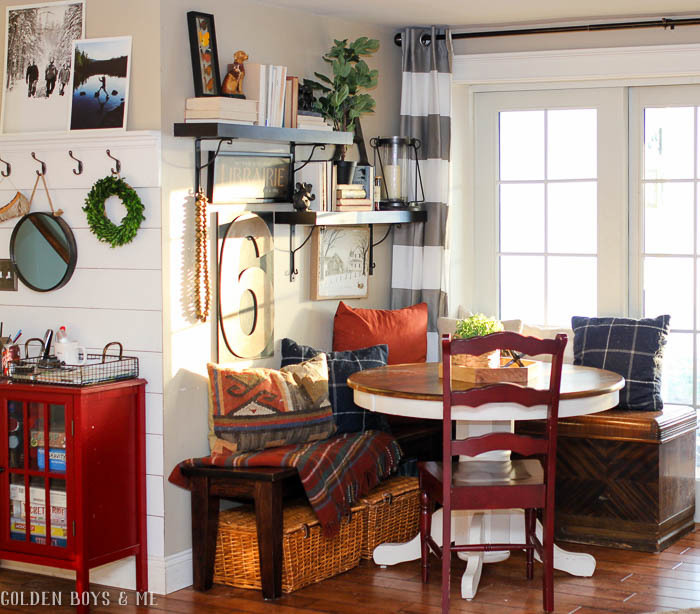 It's a fun, whimsical space! So pretty, Courtney - and you have the best accessories! This is so perfect. I love that you did your research and didn't have to add money. it really looks cozy! Oh, that is a wonderful area! You did such a great job!